The Linux Foundation has just launched a series of webinars that are free to the public. The press release can be found here. The best part of these webinars, besides them being free of charge, is that they are being led by multiple luminaries in the open source community. Not too often can you go get a refresher on Linux Performance Tuning by someone like Ted Ts'o. Therefore, I credit the Linux Foundation with putting forth a list of talented individuals to educate more of the public on certain topics in open source software. I am sure that the goal is to get people interested in taking part in the training programs that they offer. Whether that be the case or not, and it would not be a bad idea if it was, it is good that they are providing this wealth of knowledge back to the community. 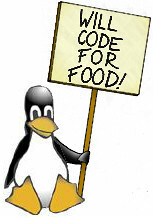 There is always a need for talented open source developers, no matter the economic situation. The more that are available will just continue to lead to more adoption throughout the world.